We first reported the possibility of the Galaxy Nexus launching on Verizon a couple of weeks ago thanks to a roadmap that floated into our inbox from some friends. Last night, it returned over at The Verge in a quote that has rocked our inbox. 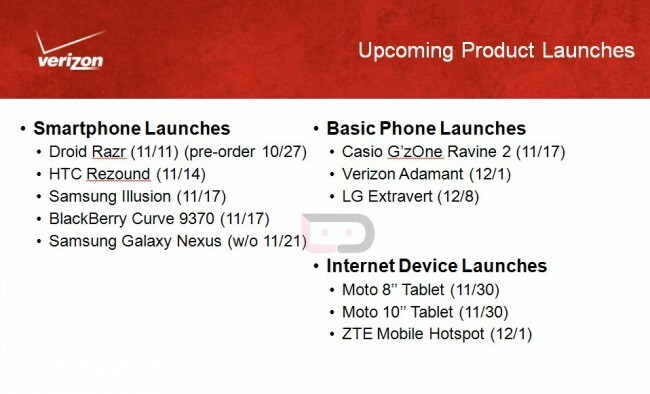 Their crew apparently heard straight from Google that the G-Nex will be “pretty much everywhere” by Monday, the 21st. Ahh yes, but even in that simple three word phrase, there is still just enough uncertainty that we can’t really take it to mean that we will 100% see the 4G LTE version in 3 days. “Pretty much” doesn’t exactly mean everywhere, it means almost everywhere. It also doesn’t say “4G LTE” or “Verizon anywhere in it. Let’s assume something does happen on November 21 though, for the sake of having some fun with all of the rumors out there. There are a variety of scenarios that could go down, so we have put them in fancy bullet point format for you after the break. Scenario 1: The phone arrives in store shipments this weekend (probably unlikely unless they show up today) and goes on sale Monday, November 21. The world throws a massive party. Scenario 2: On Monday, the phone is announced as available for pre-order immediately and will be in-stores and online November 28. Where does November 28 come from? We are going on what our sources have said, and they are indicating that the 28th is shaping up to be the official day. We have also seen various VZW marketing materials that show a big Galaxy Nexus push happening just after the holiday weekend, on or around Cyber Monday. Scenario 3: The phone is announced as available via the “web only” on November 21, but will be in stores on November 28. How could this happen? Well if our sources and other rumors are correct, there are still a couple of last minute bugs that are being ironed out as I type this. If those are fixed by the 19th (tomorrow), the phone will be ready to ship. Since stores haven’t received their actual shipments yet, Google and VZW could technically make the phone available online for orders before they can get it into stores. Scenario 4: On Monday, Google and Verizon announce that the phone will be available November 28. Scenario 5: Both the 21st and 28th are completely wrong and the phone gets pushed until December or some other non-rumored date. As you can see from that semi-ridiculous list of scenarios, its anyone’s guess at this point. Google is saying “pretty much everywhere” on November 21, but until they say “it will be everywhere including the U.S. on November 21, here is the announcement from Verizon,” you should still be a little skeptical. Such a mess. Taking any of the scenarios above? Cheers DJ, Walt, Mark and everyone else!